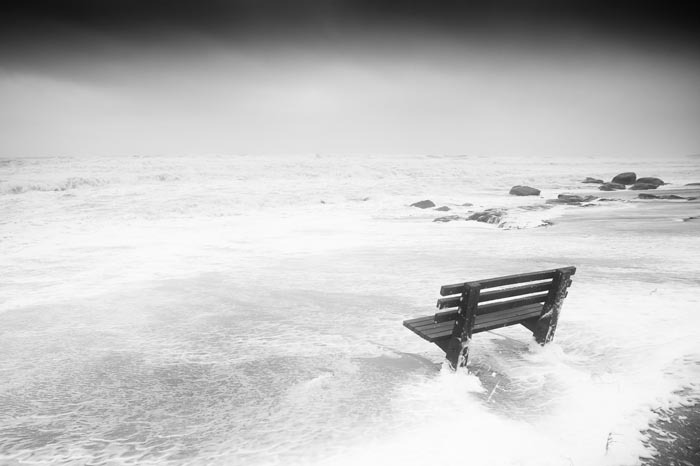 Empty bench, but no takers at Lucy Vincent Beach. Martha’s Vineyard lost a lot of sand from its beaches, a lot of limbs from its trees, and electricity for varying periods, but otherwise came through Hurricane Irene largely unscathed. The exception was along the south shore, where erosion brought several homes disturbingly closer to the ocean. Chilmark building inspector Leonard Jason confirmed that one house has become precarious. One home near Stonewall Beach was only 13 feet from the edge of the bluff before the storm; now it is on the brink of falling into the ocean. The Chilmark conservation commission has called an emergency meeting for this morning to discuss urgent requests from three homeowners following the storm — one owns property on Nashaquitsa Pond, the other two on Whale Hill. The meeting is at 11 a.m. at the town hall. After having been effectively cut off for 24 hours, the Island was connected again to mainland America yesterday. Ferries were steaming and planes were flying into and out of the Vineyard again, on a more or less regular schedule, by mid-morning. Power had been restored, buses were running and highway crews were cleaning up debris. Not all contact was resumed. The local public radio station, WCAI, remained off the air yesterday afternoon. The station Web site attributed the problem to a power outage at its Woods Hole studio. 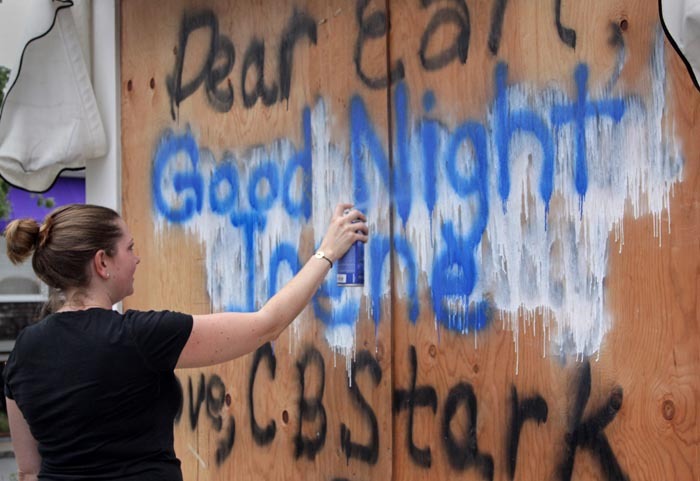 Irene was not as big a storm as had been expected, but still left lasting marks on the Island. 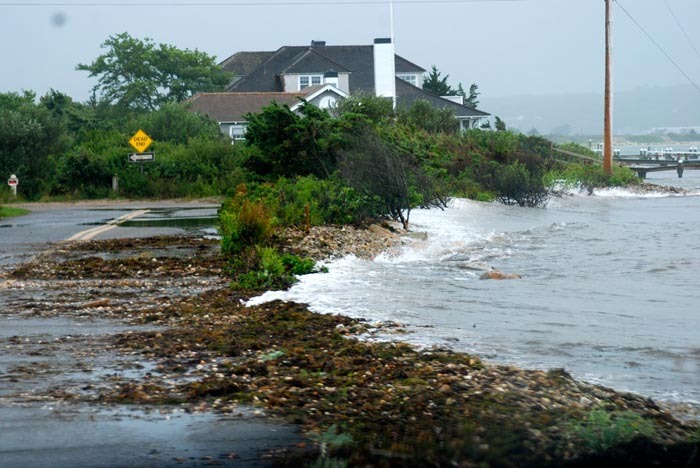 Chris Kennedy, Martha’s Vineyard superintendent for The Trustees of Reservations, said there had been significant erosion. At Long Point, the outside beach remained closed while repairs were made to fencing and other infrastructure. Norton Point was closed on both the Edgartown and Chappaquiddick sides due to flooding of the trails behind the dunes. At Wasque a sliver of the parking lot remained at the swimming beach. Waves removed about 15 feet of the Wasque cliffs. The permanent boardwalk on the north side of Wasque, which had been in place 20 years, also was lost, Mr. Kennedy said. Chilmark beach director Martina Mastromonaco said waves cut through the access path and washed away the boardwalk at Lucy Vincent Beach. The barrier beach along Chilmark Pond was breached and now is open to the ocean. 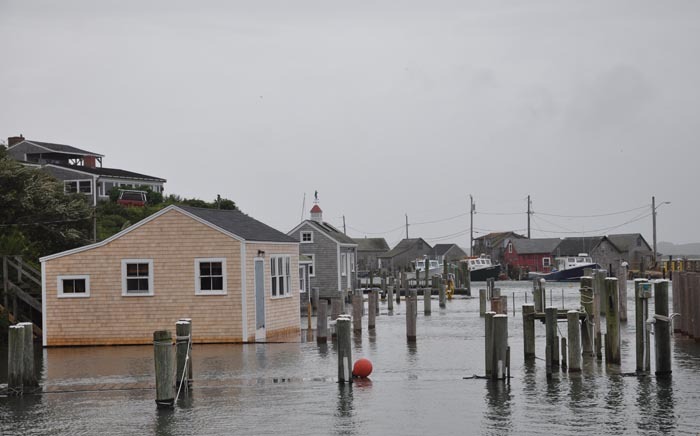 In Edgartown Dana Gaines of Katama, an artist and veteran sea kayaker, said the huge seas had widened the breach in Norton Point — opened by a storm on April 2007 — by about 500 feet. Mr. Gaines, measuring with a GPS device, said there was some erosion from the spit at the Chappaquiddick end of the breach, but that the main retreat was on the western, or Norton Point beach side. 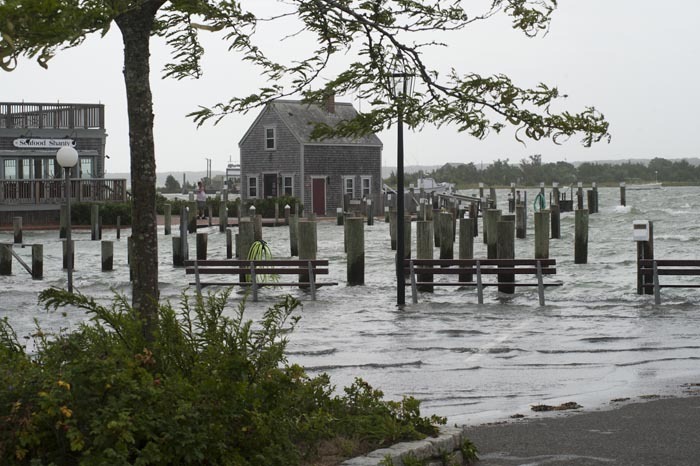 Edgartown shellfish constable Paul Bagnall reported the storm surge which accompanied Irene had poured through the breach into the Edgartown Great Pond and raised water levels by four feet. The water was pouring back into the Atlantic yesterday, giving the pond its best flushing in years. 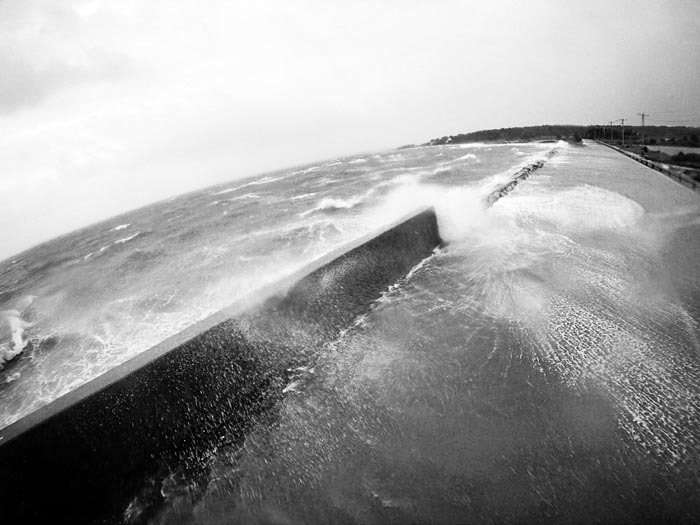 One remarkable feature of Hurricane Irene was that the back end of the storm, hours after it had made landfall, was actually windier than the front end. “We had our highest winds between about 4 and 5 p.m.,” Mr. Kennedy said. Waves washed over the barrier beaches into most of the south shore ponds. Mr. Kennedy said one of his property supervisors had reported “green water,” not just foam, thundering into the Tisbury Great Pond. Away from the coast, the storm’s main impact was on power supplies. Worst affected was Aquinnah. Police chief Randhi Belain said most of the town lost power around lunchtime on Sunday. It was not restored until 11:15 p.m. Otherwise, there were no incidents more serious than downed tree limbs. The chairman of the Chilmark selectmen, Frank Fenner, reported that most of his town also was blacked out from around 4.p.m. “Most places were back on by about 8, I believe, but I don’t think some were back up until this [Monday] morning,” Mr. Fenner said. 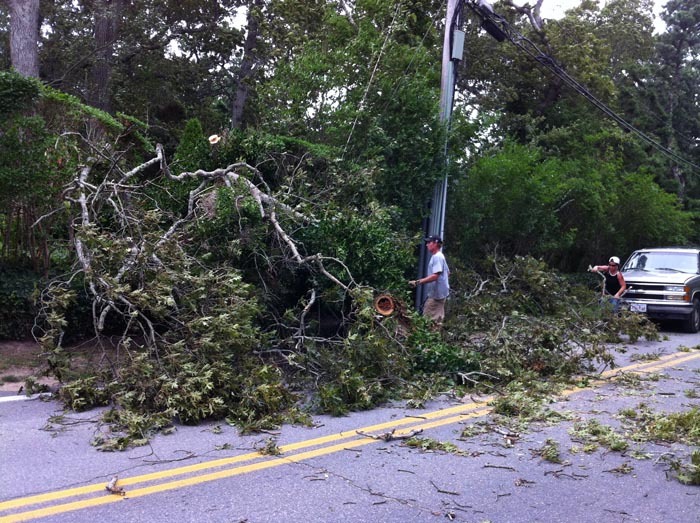 West Tisbury emergency services director John Christensen said large areas of his town lost power for up to five hours beginning at 1:30 p.m. The electricity supply problems were progressively less severe down-Island. Tisbury fire chief John Schilling said the storm had been relatively uneventful, other than for falling trees and branches, and minor power outages. 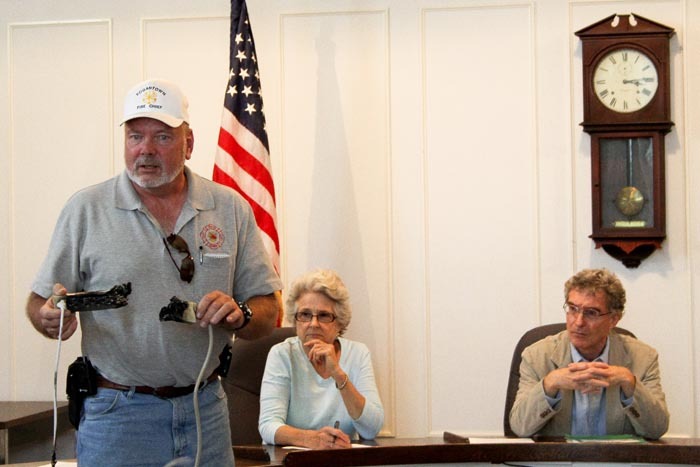 Edgartown police chief Tony Bettencourt said there had been some minor outages, and also was complimentary of NStar’s efforts in fixing them quickly. NStar’s network held up better than Comcast’s cable service. Disruptions were widespread, at one stage reportedly affecting 75 per cent of the Island. Mr. Christensen expressed concern that the cable network and Internet outages could hamper emergency services in a real crisis. “These Internet failures are something we will have to look at addressing,” he said. At least one person saw an upside to the cable outages. Anne Evasick of Island Entertainment said she rented 700 movies on Saturday, a very big day for business. Despite the weather, a number of other businesses continued to trade. There was one medical drama during the storm. Around midday, the Chappy ferry was called back into service to carry an ambulance bearing a seven-year-old boy with a broken arm. Despite waves of three or four feet in the harbor, the ferry made the trip without further incident. But there appear to have been no serious injuries as a result of the storm. 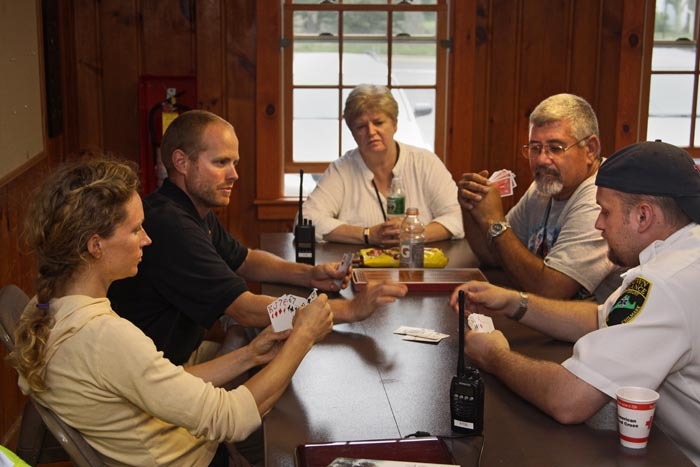 Martha’s Vineyard Hospital was ready with extra staff in anticipation of Irene, but they were not needed. None was for storm-related reasons. “One difference was that we had a couple of cases which normally would have been lifted off-Island. We had to keep them here, but they’re fine,” Mr. Walsh said. “We had a few older couples come in to sit it out. We got them a couple of meals,” he said. 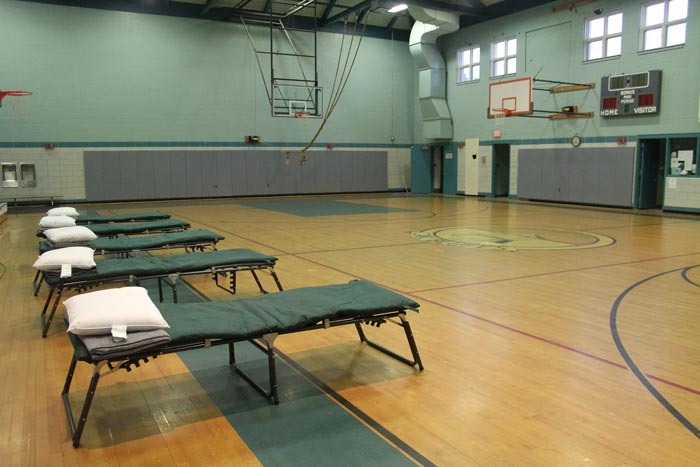 Nor was there great demand for the Island’s emergency shelters, set up in the elementary schools in Oak Bluffs, Tisbury, Edgartown and at the Chilmark Community Center. They opened at 4 p.m. on Saturday. All were closed by Monday morning. Chilmark health inspector Marina Lent said only two people stayed at that town’s emergency shelter at the community center. Both were dependent on oxygen, and needed to stay somewhere with backup power. Robert C. Porter, lead volunteer for the American Red Cross, said the shelter at the Edgartown School had nine people Saturday night. Eleven registered in Tisbury. When Edgartown closed its shelter on Sunday afternoon, three people who had evacuated from the Martha’s Vineyard Family Campgrounds went to Tisbury. Oak Bluffs also had fewer than a dozen people. Mr. Porter said the fact that few people went to the shelters did not mean they should not have been opened. “We lucked out last year with Earl, and just because we lucked out again does not mean that next time we will. We have to do this each time; if we don’t, we won’t be able to help when we’re needed,” he said. Overall, the Island fared far better than the forecasters predicted before its arrival. At Wednesday’s briefing of Island emergency personnel, by the National Weather Service, they were warned to prepare for a category one or two hurricane, with sustained winds of 80 to 90 miles per hour, heavy rain, a major storm surge and huge seas. While the forecasts moderated over the next couple of days as Irene tracked west, the expectation was still for a storm packing hurricane-force gusts. But little of that occurred. Irene’s close passage up the coast sapped its strength, and it passed well to the west of the Island. Winds topped out at about 60 miles per hour. About a tenth of an inch of rain fell. By comparison, last year’s hurricane, Earl, which passed to the east of the Island, dumped 6.2 inches of rain. One upside of the meager rainfall was that no pollutants were washed into waterways. Ponds were reopened to shellfishing yesterday. The Island’s south-facing beaches remained dangerous, however; the National Weather Service warned that rip currents would likely persist for several days. That did not stop Island surfers. 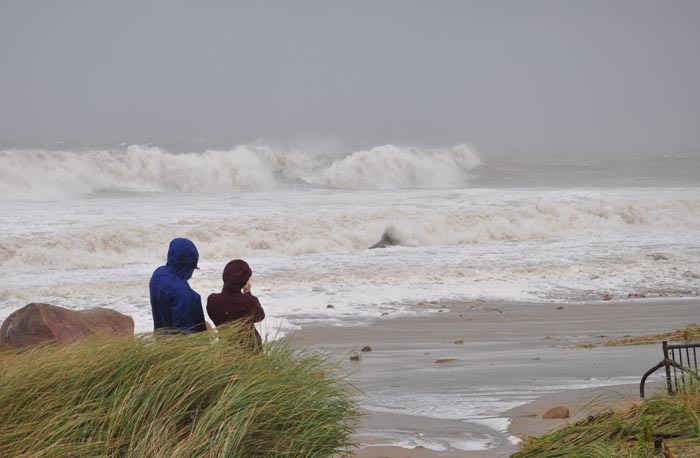 On Sunday even at the height of the storm, some moved to the north side of the Vineyard, riding beach breaks at normally placid Lambert’s Cove. By early Monday, they were back in the water on the south side, crowding the waves at Squibnocket. The Steamship Authority resumed service a little later than expected, around 8 a.m. yesterday, after the Coast Guard completed a survey of the Island sounds for debris. By early afternoon it was back on schedule. 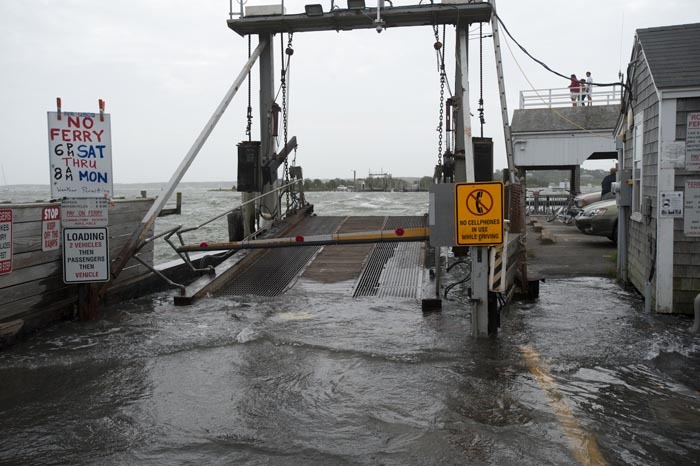 In the three days before Irene, the SSA managed to move an extra 900 or 1,000 cars off-island, before it stopped service on Saturday night. Cape Air flights ceased mid-afternoon on Friday, and resumed them on Monday, around 11 a.m. The Chappy ferry was running again by 7:40 a.m.
Gazette reporters Mark Alan Lovewell, Remy Tumin and Peter Brannen contributed to this story. For those of us who are annual visitors with a love for the island, great coverage, with great pictures. Thank you for reassuring us that generally speaking, all is well on MV. The data I'd provided via email yesterday was somehow lost in translation; it was the eastern, Chappy side of the breach which lost 500+ feet, adding 1/10th of a mile to the overall width of the breach itself. While the Katama side had been completely overwashed, its tip remains in essentially the same location.